As you probably suggested, money origami is a kind of origami that uses paper money to create artistic objects. It is the art of folding paper money into creative designs. Dollar bill origami uses similar techniques to traditional origami. However, the shape and texture of money sometimes require a different set of steps than creating the same design with origami paper. Won Park is a skilled designer from US who experiments with money origami a lot. Let’s take a look at what he has created so far and let’s get inspired by his artistic expression and handcraft skills. 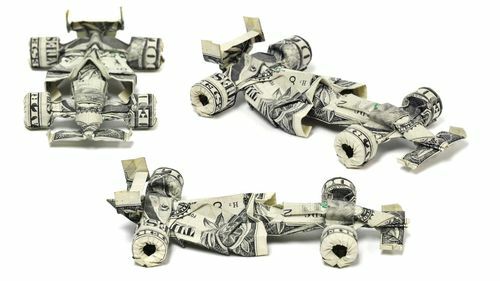 These would be impressive on just paper, but using the dollar bills …. WOW! Yes, I agree with you. Those kois are awesome. I’ve seen more complex origami on a Japanese TV show, TV champion. Maybe the author should search for more reference on this. Please learn English if you are going to post in English. If this person posted in whatever their native language is, you wouldn’t understand it at all, would you Jay? At least they had something nice to say. (You could learn from that maybe?) The internet allows us to communicate with people all over the world, even if we don’t all write perfectly in every language. Its cool postings..Its great sharing..Quite interesting..
Definitely loving the Millennium Falcon! Nice work, those dollar kois are awesome, do they bring luck ? Origami has always caught my attention. Thanks for the collection. These are awesome. I like origami but not using dollars, anyway I have to admit the little fishes look very good. I am so happy that you have made such progress over these passed years. I enjoyed meeting and sightseeing with you in ’05. Those are incredible! My wife has been thinking about doing some origami with her students though I think the ones you’ve shown in this post are way too advanced for them. Diagrams or they didn’t happen! Why is it that this great article jogs my memory of some other very much the same engineered so I read somewhere else? Fantastic! Give me the schemes! Absolutely Fantastic! I cannot believe those are all hand made. This is truly a great work of art. I am a big fan of such art. I am also going to give a dollar bill a try today, I doubt ill ever get close.